ISA, with the Ipseus software that makes it available, is fundamentally a measurement system based in well-defined psychological concepts from which reliable observations and conclusions can be made. As a measurement system, the approach requires that we capture input data from a study participant, which allows mathematical processing by the software. This is usually presented on a computer screen, often on-line. Data may be collected from any number of individuals. However, the ISA results are computed individually for each person. 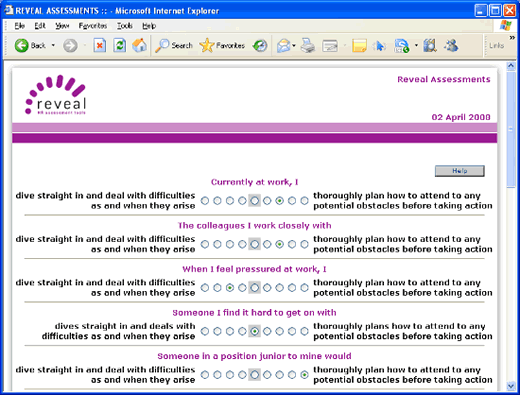 Our 'data' comes to us in the form of appraisals of a series of scenarios that are presented to the study participant. Each scenario is always made up of two elements, one usually to do with oneself or another person in a particular context, the other to do with some sort of choice about beliefs and attributions presented as psychological contrasts. We call these 'entities' and 'constructs', the latter being in bipolar form. The scenarios are presented in what many would consider a 'questionnaire' style, which we call an identity instrument (there are no questions as such). Identity instruments can consist of any number of scenarios but usually have somewhere between 200 and 300 different scenarios for the participant to appraise. This might seem a lot but it takes between five and ten seconds to appraise each scenario! In this presentation, you can see an entity and a construct being combined to form a scenario which the participant appraises. Our instruments usually have this nine point scale. The example above is a randomised presentation from one of our standard HR Assessments so you will see reference to workplace type entities and constructs. Entities and constructs are developed for specific issues and so could look very different, for example, if the subject matter was to do with community cohesion then entities might be made up of different ethnic groups and constructs might be designed to look at different mindsets or cultural preferences. Whatever the subject under review, the real value of ISA comes at the results stage. Ipseus, and any instrument or assessment built using it, presents results under a number of standard headings in tabular or graphical formats. Results report a number of different measures, many of which will not be familiar to people new to ISA. Users of Psychometrics, for example, may see some similarities with ISA results but will not recognise many of the measures that are displayed. This is why, for our more commercially orientated HR Assessments, we have taken the step of developing a range of user-friendly reporting formats, which make use of the underlying ISA measures but present them in an easier to read style. So, what are these measures? Evaluation of an entity - a measure of self or others based around the extent to which the individual appraises oneself, or the other person, as 'good' or 'bad' when compared with one's fundamental preferences. In the case of 'self', it is important to understand that people do not always feel they are acting as they would wish to and we often see significant differences between how people see themselves in different contexts. Level of identity diffusion - a measure of the extent to which people have at one extreme a dispersed and conflicted identity (very high diffusion) and at the other extreme a narrow and rigid identity (very low diffusion), ranging from an overly open to a restrictedly closed perspective towards their world and the alternative viewpoints that exist in it. Highly diffuse people may be very open to alternative thought processes, perhaps too much so, whereas less diffuse people will tend to have more fixed views. People at extreme ends of the scale can be experiencing difficulties or may be hard to work/live with. Self-development over time - every ISA based instrument captures the participant's self-appraisal of how they see themselves in the past, currently and in the future. Using the measure of Evaluation above, we can tell to what extent people appraise themselves positively or negatively across this timeframe. Ego-involvement with an entity - a measure of the extent to which the individual feels something about that particular entity. A low level of Ego-involvement means that the person is not particularly engaged with that entity. Again, the entity in question could be oneself at a particular point in time or in a particular context, or it could be someone else. A good example would be a well-known politician. Some people get very connected with particular figures while others really don't form a view. Note that a high level of Ego-involvement with an entity does not indicate a positive or negative view of that entity, just that it is important to the participant. So, the Ego-involvement measure and the Evaluation measure are very powerful when taken together! Structural Pressure on a construct - a measure of fundamental pressures arising from a person's appraisal of self and others that contributes to the manner of believing certain things designated by the particular construct. Positive pressures contribute to stability of beliefs, while negative pressures undermine their stability. This is one of the most important measures in ISA since it indicates very clearly both the core beliefs and values held by the person on the one hand and those that are conflicted and under stress on the other. Emotional Significance of a construct- a measure of the emotional intensity with which the person relates to the issue designated by the construct in question. Emotional Significance and Structural Pressure are best used in tandem, so that, for example, a person's conflicted beliefs may be about an issue of considerable emotional significance or of much less significance. Idealistic Identification with another person - this measure assesses the degree to which the individual appraises the other person as having qualities in accordance with those of his or her ideal self-image. This measure will indicate who is likely to be the person's role model or 'hero'. Contra Identification with another person - this measure assesses the degree to which the individual appraises the other person in terms of qualities from which he or she would wish to dissociate. This measure will indicate who is likely to be the person's 'villain'. Empathetic Identification with another person - this measure assesses the degree to which the individual appraise him or herself as sharing qualities with that other person - whether these qualities are positive or negative. Conflicted Identification with another person - this measure assesses the degree to which the individual appraises that other such that oneself is as the other while wishing not to be so. It is actually a measure combining aspects of Empathetic and Contra Identification and is an indication of problematic identification with the other person. These are the generic measures that any ISA or Ipseus based instrument will be able to report. The manner in which these measures are used individually or in combination to form conclusions is dependent on the nature of the study and this requires specific training. Identity Exploration have developed specialist reporting formats, primarily for HR Assessments, where we have automated the observational and conclusive aspects of the report to make it easier to use.